Nowadays with the IoT trend is more and more common to have devices connected remotely for monitoring or service purposes. Teltonika with 20 years of experience is a leading company from connected vehicles to networking solutions. Murrelektronik's TREE series switches can connect Ethernet terminal devices. The new TREE67 models - equipped with four or eight M12 ports - are suitable for applications in harsh industrial environments. They make it possible to cost-effectively implement decentralized machine concepts in star topologies. 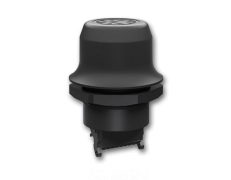 The new IP67 switches are immune to EM interference and resistant to vibrations. They work flawlessly in applications with a wide temperature range: from -25°C to 60°C. The four or eight M12 connections (d-coded) support transfer rates of 10 or 100 MBit/s. With the auto-negotiation function, the devices automatically detect which rate is currently needed. VLAN tagged Profinet frames always have the right of way, they are automatically prioritized in the traffic. With up to two CAN High Speed channels, one CAN Low Speed channel, and a LIN channel, depending on the device variant, a wide variety of applications can be addressed by the USB-to-CAN V2 IXXAT® - HMS – in both the industrial and the automotive sectors. The Anybus PROFINET to .NET gateway enables factory-floor data from PROFINET to be presented to .NET applications. New possibilities for industrial wireless solutions. HMS features a new and updated version of the popular Anybus Wireless Bridge. The Anybus Wireless Bridge II supports reliable wireless communications, up to 400 meters and can communicate via Bluetooth or WLAN. It is ideal for replacing Ethernet cabling in locations that are difficult to access, dangerous or where it is impossible to install. For industrial devices with a serial RS-232/422/485 interface, HMS makes it possible to configure almost any Produce/Consume, Request/Response or simple ASCII protocols with its flexible serial frame building method contained within the included "Anybus Configuration Manager". The ISD300/400 photoelectric sensors for data transmission enable optical wireless communication along the path of the beam. This system is a friction-free alternative to trailing cables, e.g. in high-bay stackers. The system consists of a device pair, i.e. optical data sender and receiver. Both units can communicate in both directions over large distances. The point-to-point light beam is monitored during data transmissions. Interruption of the light beams is indicated both optically on the device and signaled via a special function interface. The Adam 6050 has a 10/100 Base T (x) Ethernet interface compatible with Modbus TCP protocol and provides 12 digital inputs and 6 outputs with 2000 VRMS electrical isolation. This module provides a logic block programming utility through the well-known GCL. You can always access the status of the inputs and outputs by viewing the web page of the device due to the internal Webserver. The Anybus M-Bus to Modbus TCP gateway decodes M-Bus telegrams for easy overview and mapping of meter values. You can connect up to 20 M-Bus slaves and enable them to communicate on a Modbus-TCP network. You can also connect your M-Bus devices to any other industrial network by pairing the M-Bus gateway with an Anybus X-gateway for Modbus-TCP. This easy-to-use gateway creates a connection from Modbus-TCP to any other industrial network. Wireless connector giving a machine or cabinet wireless access via Bluetooth® or Wireless LAN (WLAN). Gateway wireless bolt enables you to connect industrial machines and devices to a wireless network. It is attached onto a cabinet or a machine to enable wireless access over Bluetooth®, Bluetooth Low Energy® or WLAN (WiFi). On the wired side, the Anybus Wireless Bolt communicates over Industrial Ethernet, supporting protocols such as BACnet/IP, PROFINET, EtherNet/IP, Modbus TCP as well as TCP/IP and UDP. Anybus Wireless Bridge allows industrial Ethernet based equipment to be installed with wireless technology and makes it possible to bridge protocols such as PROFINET, EtherNet/IP, Modbus-TCP, BACnet/IP etc. over a distance of up to 1000 meters (open air range). The EKI-2525LI is an unmanaged 5-port Ethernet switch that comes in an ultra-small palm size, making it the ideal solution for environments with limited space. 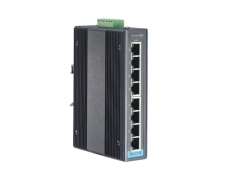 Understanding how much a future-proof, ready-to-use product means to each user in the fast-changing market, Advantech provides user the smallest Ethernet switch ideal for instant installation with minimum costs and efforts, allowing users to upgrade to an intelligent plant at ease. Nowadays we see a bigger request for faster networks and the EKI-2728 supports Gigabit Ethernet to reply to this demand. Each port of EKI-2728 has 2 LED’s to show the link status transmission speed and collision status. In the event of a power failure, the built-in LED will activate the alarm to notify administrators. Engineers can simply verify the hardware status by checking the LED, and have troubleshooting easy and quick. 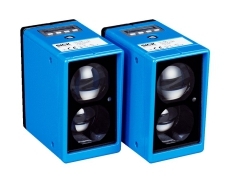 EKI-2728 comes with compact metal housing that rates IP30 to help against from dusty industrial environments. LPWAN technology including LoRa, SigFox and NB-IoT is suitable for applications requiring low-volume, long-range data transmission, while maintaining a long battery life, minimal cost and low levels of interference. The WISE-6610 is a high-performance LoRaWAN gateway that offers reliable connectivity for industrial environments. It supports the LoRaWAN protocol for building LoRaWAN private and public networks, as well as various protocols including MQTT. The hardware and software flexibility of the WISE-6610 provides rich features for edge intelligence systems, and its support for VPN tunneling with various protocols ensures safe communications. The Anybus® X-gateway family is a product line consisting of over 200 different products aimed to connect almost every possible combination of two industrial networks. The product family supports 17 different fieldbus networks such as Profibus, DeviceNet, CANopen and CC-Link as well as industrial Ethernet versions supporting Profinet, EtherNet/IP, Modbus-TCP and EtherCAT. The X-gateways are designed for use in industrial automation plants where increasingly many different networks are used. The X-gateways help system integrators to easily inter-connect any two networks, enabling consistent information flow throughout the entire plant. The Anybus® X-gateway for Modbus-TCP makes it possible to connect Modbus-TCP devices to almost any other PLC system. The X-gateway provides Modbus-TCP client (master) connectivity to all major fieldbus and industrial Ethernet networks and is easily configured and installed. No programming required! TRB14x device family is designed to provide direct access to various devices from the network. It contains a high performance ARM Cortex-A7 1.2GHz processor and 256 megabytes of RAM. It is equipped with mission-critical LTE capabilities and a Linux environment offering high degree of customization. Devices in the TRB family come with either one of Ethernet, RS232 or RS485 ports offering a specialized solution to a particular problem. TRB family devices are designed to be small, lightweight and energy efficient - allowing you to do IoT projects with ease. MKV Metal and Impact67 IO-Link fieldbus modules take you directly to where you want to go. They are ideal for integrating IO-Link devices into installation solutions. The advantages: fast integration, brief commissioning times, yet maximum flexibility. The basic feature of this easy integration is 'IODD On Board', an innovative technology by Murrelektronik. The sensor and actuator parameter data stored in the IODD (IO Device Description) are directly incorporated into the GSDML files of the Murrelektronik MVK Metal and Impact67 fieldbus modules. 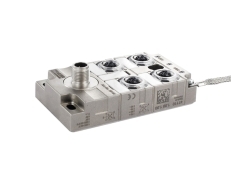 If these devices, for example IO-Link sensors or valve terminals, are connected, you can access this stored data directly and very conveniently via your control software, with no need for manual parameter setting or special tools. The WISE-4610 adopts LoRa technology, providing outdoor nodes that consume little power when transmitting data over long distances. This means that it can be powered by a solar rechargeable battery, enabling continuous data acquisition. New standards in automation technology. Cube67 from Murrelektronik is the modular, distributed I/O system that uniquely combines IP20 and IP67 protection - plug-connected, robust, fully encapsulated. Starting at the bus coupler, the I/O layer spreads radially throughout the application. The hybrid system cable connections for power supply and communication between individual components in the system are rational and clear: Assemble - plug in - that's it! The new PROFIBUS DP master card creates a world of possibilities for Mitsubishi Electric L-Series PLCs. It is still one of the most popular field networks in Europe, used in many industries, being the most successful fieldbus in the world with 43.8 million devices installed. The Profibus network is one of the most used automation networks in Europe. With a wide range of equipment compatible with this network and available in the market and already installed in the industry, the L series PLCs from Mitsubishi Electric are able to integrate any new or already installed automation system, when connecting in a communication network Fast and robust. New IoT gateways from HMS allow industrial equipment to communicate with power grids. The Anybus SG-gateway family is designed for Smart Grid communication and specifically target Demand Response (networking of industrial electric loads) and Virtual Power Plants (networking of energy resources like biogas plants or combined heat and power units) applications. All the Anybus SG-gateways support the communication protocols used in the energy sector, e.g. IEC60870-5-104, DNP3 and IEC61850s. In addition they also include Modbus TCP Client/Server and Modbus RTU Master/Slave functionality. With a Netbiter communication gateway connected to your PLC or machine, you can do programming or debugging from any location. Just like being on site!